1. Avoid harsh cleansers like bleach. Vinegar is just as effective at killing bacteria (as well as mold), and a lot of the non-toxic store bought cleansers are available in anti-bacterial formulas. These natural cleansers are readily available in most grocery stores. 2. Deodorize naturally. Chemicals in store-bought air fresheners can trigger headaches and increase asthma. I love slicing up an orange and simmering it in a large pot with a few cinnamon sticks. You can also use herbs or vanilla beans. Don't forget about candles as well. A lot of them release chemicals into the air you breath. Look for candles made with natural essential oils and soy or palm or bees wax. 3. For caked on messes inside your microwave, try one of these all-natural way to clean a microwave by warming water mixed with vinegar, lemons or dish washing liquid. You simply place it in a bowl and microwave it for a few minutes. It creates steam and softens all the caked-on mess so you can easily wipe it clean without scrubbing or harsh cleansers. 4. For hard water stains inside your toilet, an all-natural alternative is to scrub it with a pumice stone (yes, the kind you usually use on your tootsies). 5. 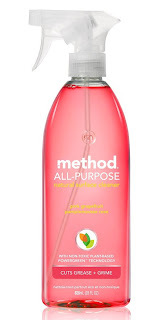 Don't give in to all the commercialized cleaning tools that are disposable. There are so many other products now like dusters, mop heads, and toilet wands which are now available in disposable options. They may be slightly quicker and easier, but if we opted for reusable cleaning products, we could drastically reduce our waste. A sponge is really the only cleaning item that needs to be disposable. 6. For disposable cleaning tools like sponges, try to find a more eco-friendly option. Scotch Bright Natural Fiber Scrubbing Sponges are made from renewable resources. You can get them in bulk online or in stores. In Frederick I've found some at the Walmart off Bukeystown Pike. 7. Go 100% natural with your household cleansers by using things like vinegar for glass surfaces, olive oil for wood polishing, and lemons with baking soda for scrubbing kitchen and bath surfaces. 8. For cleaning surfaces like windows, you can swap out the disposable paper towels and still get a streak free shine by using lint-free cotton cleaning rags aka flour sacks. I got a large pack for about $6 at the Walmart off Buckeystown (in the section where the kitchen towels and oven mits are). 9. For a natural carpet deodorizer, sprinkle the area with baking soda and let set for at least 30 minutes before vacuuming. 10. If it's time for a new vacuum cleaner, pick a bag-less version so you'll create less waste. Just don't use the same pumice stone for both things. Thanks for the tips! I can use most of these!